Make no mistake. It's all about money. His name is Donald Trump (He's number 6 on the list above) and he's busy feathering the nests of his fellow rich rats before even being sworn in as the country's next president. Trump and his greedy minions can't wait until President Obama leaves the White House so they can reverse the stay he just put on the Army Corps of Engineers. Flip-flop artist Paul Ryan tweeted, "This is big-government decision-making at it's worth. I look forward to putting this anti-energy presidency behind us." Well, I'm sure Ryan does look forward to a future of no restriction for Big Oil. 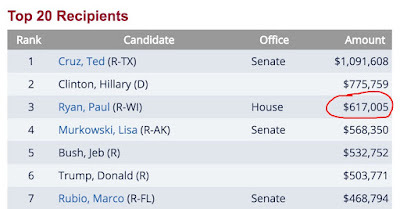 Notice the list on top of this page - Ryan's the 3rd biggest benefactor on Big Oil's Bribe parade. He joins his fellow Congressmen and other wealthy Americans who have turned their backs on the public's best interest and safety. 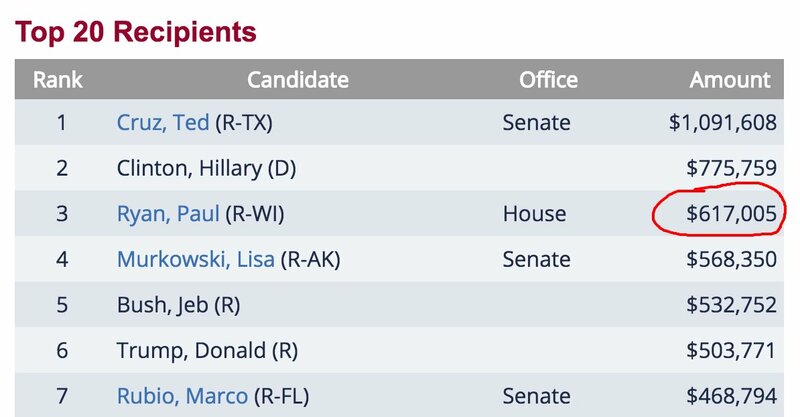 Here's more information on the Top Corporate contributors (2015-16) lobbying for oil interests in Washington. As you look over the list you'll see that Energy Transfer Equity (the company behind the Dakota Pipeline project) is number nine on the bribe hit parade. Related: Fossil Fuel Funding to Congress: Industry Influence in the U.S.
For every $1 the industry spends on campaign contributions and lobbying in DC, it gets back $119 in subsidies!! In summary, I think it's a foregone conclusion that the Dakota Pipeline will be completed because Big Oil can't be stopped. It has too many tentacles in our government.